Now that Star Trek Discovery’s first half-season has to come an end, you’ve probably been twiddling your thumbs like I have, wondering where to channel all that revitalised Trekmania. As luck would have it, Christmas is coming up, and nothing says Yuletide quite like some spanking new Star Trek merch to wear, watch, or play with over the holiday season. 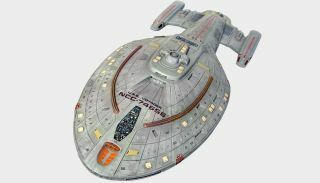 The sci-fi franchise is over 50 years old, meaning there's half a century's worth of Trek themed goods and commodities to consider for your collection. Fortunately for you, I’ve sorted the wheat from the chaff to bring you some of the best value for money Star Trek merch out there, from affordable accessories to high quality gems. This Star Trek Discovery tee successfully treads that fine line of pop culture referencing: it’s subtle, but not so obscure as to go over the heads of a fellow Star Trek fan; authentic, but not too in your face with its promotion of the source material. Plus, even the non Trekkies can appreciate why you’d want to proudly have the word DISCO trawled across your chest, even if the wider connotations mean absolutely nothing to them. Return to where it all began with all 79 episodes of the original series by Gene Roddenberry, lead by none other than William Shatner’s James T. Kirk. It’s one for the Star Trek fan who wants to understand all those sly references in Discovery, and the series still holds up as a great piece of serialised sci-fi in an of itself. Thirsting for something a little more modern? There’s two great films (Star Trek and Star Trek Beyond) and one just okay film (Star Trek Into Darkness) in the franchise's latest cinematic trilogy but, together, they represent a worthy slice of slick sci-fi adventures, dressed up with the kind of popping visuals that the Trek-verse has always deserved. A no-brainer of a Dad gift, this one. Functional, funky, and really quite fluorescent, all three pairs of socks included in this purchase are eye-catching in all the right ways. Plus, it’s the perfect way to subtly let people know where your loyalties lie when it comes to the endless ‘Wars vs. Trek’ debate. Some of the best Star Trek scenery is found within this substantial collection of classic films, from the famous “Khaaaaaan!” moment in Star Trek II to the high-stakes battles of Star Trek: Nemesis. Each film has been fully remastered, too, and this Blu-Ray version plays them all in glorious high definition. Lovely. Capitalism still exists in outer space, you know. You’re just dealing in the business of ships and space stations instead of property and public services. The Continuum Edition of Star Trek Monopoly is not only the first and last excuse you’ll ever have to say the words “continuum edition” in the same sentence, but it’s a damn fine board game replication of the Trek universe, too. Get it, and hope that the family arguments stay diplomatic during each game. The picture does more justice for this product than words ever could. It’s a hologram of the USS Enterprise that also happens to light up your house with a lovely translucent glow, in any colour of your choice. Your table will look like a sci-fi battle station, yes, but that’s all the better for impressing any guests.